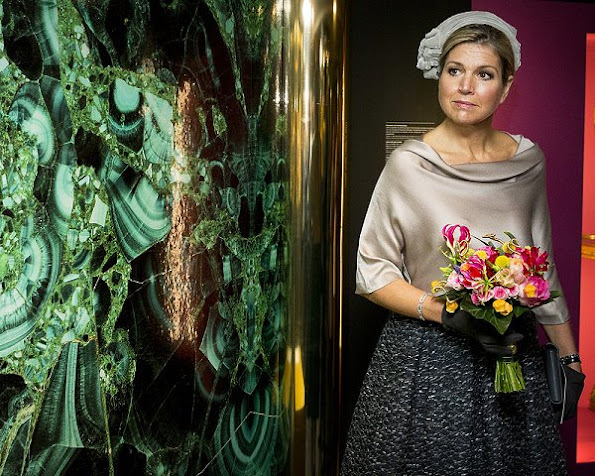 Queen Maxima of The Netherlands visited Anna Pavlovna exhibition at the Het Loo Palace Museum (Paleis Het Loo Nationaal Museum) on October 5, 2016 in Apeldoorn, Netherlands. This year marks the 200th anniversary of the Russian born Grand-Duchess wedding with future King William II of The Netherlands. 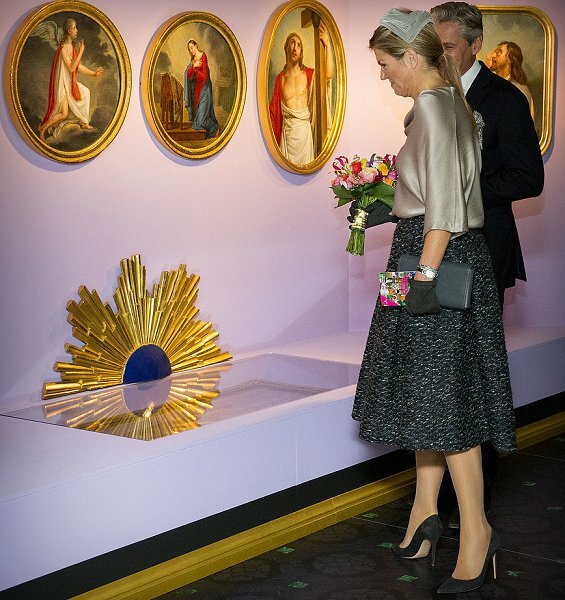 The exhibition displays many of her valuables, including crockery and furniture. Not a fan of that hat. Nor the blouse. OMG THAT HAT IS AWFUL. Like the skirt if it had been paired with a different top. Exactly. I feel nothing but meh on this outing. What a silly headpiece. And the blouse is not flattering at all. It would be a nice vintage look except it isn't. I agree all the pieces are more or less ok yet it doesn't work. I think it's mainly the blouse that ruins the look (not even the headpiece). Also, did you all see her hair? That is not a bun behind the bath cap, no, ladies! It's just a sad ponytail, visibly a last minute solution. I had not noticed the hair at all. I was stunned by the clothes. Oh no Maxima wtheck is going on here? A pony tail? A very sad pony tail. No lift no nothing. Vind het niet mooi. Vreemd hoofddeksel. J'avais la même jupe il y a 50 ans !!! Love Max just wish she could stop wearing all these crappy bath caps on her head. Queen Maxima looks lovely (it's the smile). It pains me to say it, though, but I don't care for the ensemble. I actually like all the pieces (maybe not so much the hat, I'm a bigger hat fan), but they don't feel cohesive to me. There's not one thing I like about the whole ensemble. Nothing seems to go together, everything is out of proportion. Total fail. It looks like she was in a hurry and ran to the wardrobe to grab something to wear! Nothing goes together at all a very mismatch outfit.